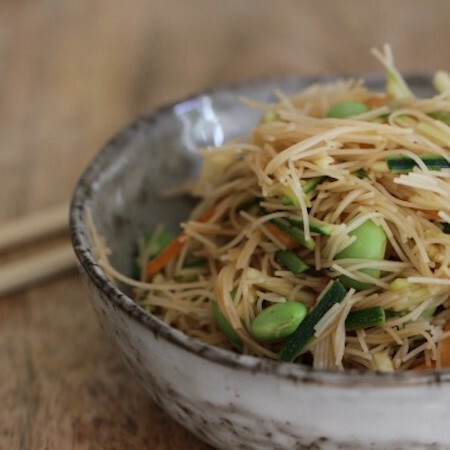 This rice noodle salad with an almond butter dressing is a perfect gluten free, vegan option. Packed with flavour and on the table in under ten minutes. Place the vermicelli in boiling water for 5 minutes. Whilst the noodles soak, julienne the vegetables and place into a large bowl. Drain the noodles and add to the vegetables, using kitchen scissors chop everything up. Whisk the almond butter, tamari and vinegar and dress the noodles/vegetable mix. Chop the cashews up and then place into a frying pan. Over a medium heat, toast the nuts for two minutes. Stir into the noodles.